CARSON, Calif. (AP) — Tyreek Hill helped get the Patrick Mahomes era off to a blazing start for Kansas City. On a day when the Chargers’ biggest concerns were Mahomes and Hunt, it was Hill’s big plays that set the tone. Hill had a 91-yard punt return for a score and a 58-yard TD reception during the first quarter to give Kansas City a 14-3 lead. He then added a 1-yard reception on a shovel pass for a score in the fourth quarter to put the game out of reach. After the Chargers got the opening kickoff but went three-and-out, Hill took Drew Kaser’s punt 91 yards for a touchdown just 1 minute, 57 seconds into the game. The third-year receiver fielded the punt near the right hash mark, but quickly found an opening up the left sideline. It was Hill’s fourth punt return for a touchdown in 32 games and the Chiefs’ league-leading seventh since 2013. 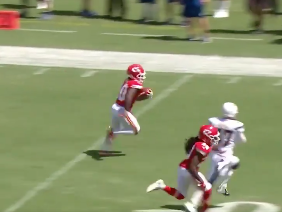 After Caleb Sturgis’ 45-yard field goal got the Chargers on the board, Mahomes threw his first touchdown pass in the NFL, connecting with Hill for 58 yards . Hill caught the pass at the Chargers 47 and eluded a diving tackle by Jahleel Addae as he found a seam up the left sideline. Hill’s third touchdown came with 9:42 remaining on a 1-yard shovel pass from Mahomes, who became the third quarterback in Chiefs’ history to throw four touchdowns in an opener. Rivers’ 424 yards are the most by a Chargers’ quarterback in an opener, but two turnovers led Chiefs’ touchdowns. A 20-yard TD reception by Keenan Allen and 2-point conversion catch by Antonio Gates brought the Chargers within 11, but JJ Jones’ fumble of a punt at the Chargers 2 and subsequent Hill touchdown made the deficit too much to overcome. “It’s one of those games that you’re sick that you let it get away, because you didn’t make all the plays that you really dream about making. … It does nothing but make me be excited,” said Rivers, who was 34 of 51 with three touchdowns and an interception. Chargers: RT Joe Barksdale was carted off after injuring his right knee during the first quarter and did not return. Lynn said he did not know the severity of the injury. Sam Tevi took Barksdale’s place on the offensive line. Lynn also said DT Joey Bosa, who was inactive for the game, remains week-to-week with a foot injury.